Lakes, beyond any doubt, are the biggest tourist attraction of Ladakh. Some of them are quite large in size and famous; while others are a bit smaller and known to only a few. Some are easily accessible whereas a few others will require you to go a bit remote and off the road. The common factor among all these lakes, however, is that they are all stunningly beautiful. They are all charming in their own ways and present a different color each season. How many can you visit will entirely depend on the time you have in hand but if you asked me, I will recommend them all. Below is a list of lakes in Ladakh that can help you in deciding which ones you can include in your itinerary. The information below will include a brief summary about the lake; and other details like where it is located and how you can reach there. I will try to keep the list as comprehensive as I can but it is definitely not an exhaustive list. I am sure there are numerous lakes hidden up there in the hills that even I am not aware of. Pangong Tso and Tso Moriri are the two most commonly mentioned lakes but the list is definitely way longer. There are many other marvelous lakes in Ladakh and visiting them will give you a chance to be away from the crowd while enjoying the majestic scenery. Ladakh is the second largest district of India in terms of area so you can imagine how long the list of the lakes will be if all of them were documented. Why are the lakes in Ladakh such a big deal? It is not just the lake to be honest but the whole setting of it. A body of deep blue water under a deep blue sky against the barren brown of the hills of Ladakh accompanied with the white of snow at the top and of the clouds floating by, and a few ducks swimming in, definitely makes the whole picture a photographer’s delight. This is the reason why it is a lake that has become the very symbol of Ladakh in the last few years. While we go into the list, I will recommend that you take a look at Ladakh Road Map – A Detailed Map of Ladakh. This is a map of Ladakh that I created some time ago and all the lakes I am mentioning below are marked on it. It will just make it a bit easier to understand where the lake is located exactly. There is no answer to this question because no one really knows. There are several lakes that do not even have a name assigned yet. Some have not even been explored and are not yet documented. This will also depend on the definition of what qualifies as a lake. There are several small bodies of water that do not get considered as a lake even by an absolute definition of the term. Which then brings us to our next question of the lakes that will be relevant to you as a tourist. There are about 8 to 10 lakes that remain to be on tourist radar commonly and 3 that get visited the most. The reason behind is that they are either the biggest or easily accessible; or are on the way. The list below will include these lakes as well. Please note that my order of listing is only by the size and popularity of the lake. I am not comparing either of these lakes in terms of beauty or claiming one to be better than another. Below is a list of the lakes. The first name in the list can, of course, be none other than the beautiful Pangong Tso. This lake is a giant in every way, right from its size to its magnificent beauty. Running for a total length of 134 kilometers it extends from India to China; with approximately 60% of its length in China. Set against a backdrop of intense blue skies, golden plains, and snow-capped peaks, Pangong Tso is truly magical and the biggest tourist attraction of Ladakh. It is located at a distance of about 150 kilometers from the city of Leh and draws hundreds of thousands of tourists each year. It is hard to believe that this lake was unknown to the majority of people until about 10 years ago. The road from Leh to Pangong Tso is a smooth one and you can reach here without any difficulty at all. A walk along the shores of this blue beauty and a night stay in the camps here will be a memory you will cherish for long. If you were here in the month of winter, then you will be presented with an entirely frozen white Pangong. To know more on how you can plan a trip to Pangong Tso, please read How to Plan a Trip to Pangong Tso. There are several camps sites and guest houses at the lake where you can stay for the night. After Pangong, the second name always is of Tso Moriri. It may be a little smaller than Pangong in size but make no mistake; it is an equal in terms of beauty in every way. I have even had people travel to both these places and told me that they found Tso Moriri to be better. It is located at a distance of about 220 kilometers from Leh City (depending on which route you take) and at an altitude of 4,522 meters. Yes, you read it right. It is at an even higher elevation than Pangong. The difference in both these water bodies is that Pangong is a saltwater lake whereas Tso Moriri is an entirely freshwater lake. It supports a wide range of Fauna and flora including several endangered bird species. It is 19 kilometers long which makes it the largest high altitude lake entirely within India and entirely within Ladakh in the Trans-Himalayan bio-geographic region. Read Leh to Tso Moriri Travel Guide to know how you can plan a trip to Tso Moriri after reaching Ladakh. Tso Kar is the third most known lake in Ladakh but is also one of the least visited. It is located at a distance of about 150 kilometers from Leh at an elevation of 4,530 meters which puts it higher than both Pangong and Moriri lakes. Like Pangong, Tso Kar too is a saltwater lake but much smaller in size. Don’t let that stop you from visiting here though. It is a very beautiful lake that is easily accessible and can be incorporated into your itinerary. In fact, this is probably the one lake that you do not have to take out some additional time to visit. A road from Manali Leh Highway bifurcates near Pang and will bring you to Tso Kar twenty minutes later. So you can actually plan your trip to Tso Kar which either going to Leh or from Leh to Manali. Another way to visit would be to reach Tso Moriri from Leh via Chumathang and then return while taking the road via Polo Kongka La and Tso Kar. The three lakes listed above can actually be called as the most famous lakes in Ladakh. 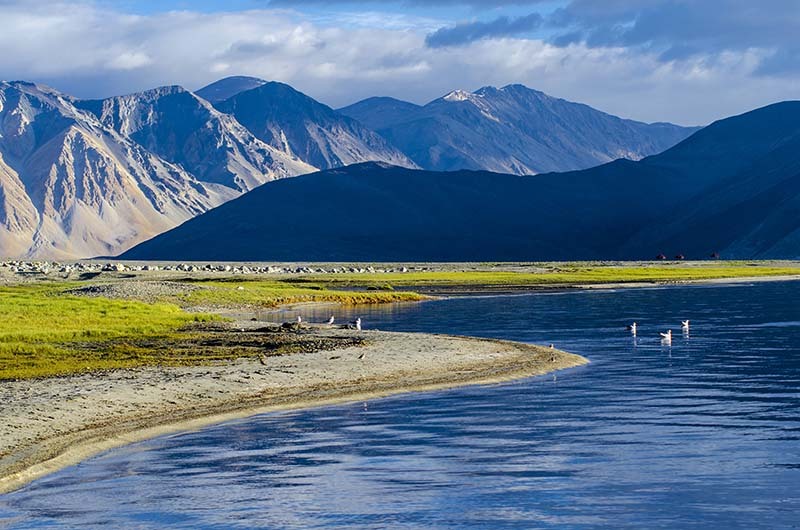 Let us now take a look at some of the lesser known lakes of Ladakh. Kiagar Tso, also known as Kyagar Tso, is located at a distance of about 190 kilometers from Leh. It is a small lesser known lake that that lies about 20 kilometers before Tso Moriri as you travel from Leh to Karzok. Not many people know about it because everyone is headed to Karzok to see the bigger lake, Tso Moriri. Everyone just ignores this small body of water and move on towards Tso Moriri but Kiagar Tso is a beauty in itself and definitely deserves a short break before you travel on. Wild animals can be seen grazing on its banks and the entire ambience of the lake is very refreshing. For visiting here as well, you do not have to take some time out and can include it in your trip to Tso Moriri. Please read Tso Moriri to Pang via Tso Kar for more information on this lake. This lake is located right next to Tso Kar Lake. If you were traveling from Karzok towards Pang, then you will first cross Startspuk Tso and then Tso Kar. The lake is at a distance of about 75 kilometers from Tso Moriri and 5 kilometers from Tso Kar. Because both of these lakes are places so closely, this small lake often gets confused as Tso Kar itself. You will in fact hardly notice it and will miss the lake if you didn’t already know what you were looking for. No additional time is needed for this lake as well and it will become a part of your journey to Tso Moriri and Tso Kar. To reach this lake, you will have to leave your vehicles on the road and walk about a kilometer. Please read Tso Moriri to Pang via Tso Kar for more information on this lake. This is a tiny yet very beautiful lake located on Manali Leh highway just before you start climbing towards Baralacha La. It is not really located within Ladakh but will definitely become a part of Ladakh trip. There are a couple of dhabas right next to the lake where you can stop for a few minutes and have a cup of tea while clicking pictures. It is located at a distance of about 160 kilometers from Manali and 21 kilometers from Jispa. This lake, in fact, is also a great spot for pitching your own tent as well. With the 2 dhabas located near the lake, you wouldn’t even have to worry about your meals as well if you were to camp here. Please read Jispa to Pang – To the Land of Lamas to read more about this lake. As you travel further from Deepak Tal and climb up the mighty Baralacha La, you will come across another small but beautiful lake called Suraj Tal. This lake actually is smaller in size than even Deepak Tal but it holds a surprise up its sleeve. This lake freezes over completely during winter and if you were traveling early in the season, chances are that you will find it in a semi-frozen state. This in fact will be the only lake in your entire Ladakh trip that you can find frozen even in June. Suraj Tal is located right at the top of Baralacha La; and at a distance of 28 kilometers from Deepak Tal and 188 kilometers from Manali. It is located on the Manali Leh route so no additional time is needed for this one as well. At an astounding altitude of 4,890 meters, this lake will be the among the highest you will cross in your trip. For majority of people visiting Ladakh for the first time, it will in fact be the highest one. Please read Jispa to Pang – To the Land of Lamas to read more about this lake. Now all of the lakes I listed above are easily accessible and visited by the majority of the tourist. Now let us go a little off the track and talk about lakes that are not visited by many people. These are lakes that are located at an even higher altitude than Suraj Tal as well. Ryul Tso will be the first one among the list. This lake is located in an extremely restricted zone quite close to the border. To get here, you will have to take the road towards Chumur from either Karzok or Nyoma. Permits for this area are not easily issued and not many people have been in this direction. This lake is located just before you start climbing up Salsal La at an altitude of 5,242 meters (17,200 Feet). The lake is slightly before the pass so it’s altitude will be a little less but will still be above 5,000 meters. Please know that to reach this lake, you must be in an SUV with good ground clearance and 4×4 capability. The road to this lake is in a really bad state. There will be nallahs on the way that will have you hesitate to cross even in an SUV. You will also be crossing Salsal La and Charchagan La on the way and the climb for both these passes is very steep. This lake is on the same route as Ryul Tso. Both of these lakes are located right next to each other on both sides of the road. It is also known as Kyun Tso or Kyon Tso. As a matter of fact, both Ryul and Chilling lakes are called as twin lakes and sometimes referred to as Kyun Tso 1 and Kyun Tso 2. Everything that I mentioned above about Ryul Lake will also remain applicable for Chilling Tso. The difference between both these lakes is that Chilling Tso (Kyun Tso 1) is a fresh water lake. Whereas Ryul Tso (Kyun Tso 2) is slightly salty even though both are closely located. There are two ways that you can travel directly from Pangong Tso to Tso Moriri; or vice versa. One is the traditional route via Chushul, Tsaga, Loma, Nyoma, and Mahe. There is however another road that you can take to travel directly from Chushul to Nyoma; without having to go to Tsaga and Loma. Majority of the tourists prefer to travel on the Tsaga route because of two reasons. First is that it is easily drivable and second is that it also takes you to Hanle. However, if you had no intention of going to Hanle and were up for going off the road on a steep climb, then you can take the direct road from Chushul to Nyoma. It is a total of 72 kilometers of an extremely steep drive on a badly broken road; that will see you crossing two high altitude passes and two very remote and beautiful lakes. These two lakes are the next in the list. As you start driving up from Chushul towards Nyoma, the first lake you will come across is Mirpal Tso (also known as Mitpal Tso). It is located at a distance of above 28 kilometers from Chushul. The entire drive from Chushul to this lake will be a nightmare and it will only get worse as you drive further. This lake is just before the Kakasang La Pass which is a few kilometers after you cross Mirpal Tso. . I am not sure about the exact altitude of this lake but Kakasang La is at a height of 5,446 meters, 17,868 feet. This lake is slightly before the pass which means that its elevation would be close to 5,200 meters making this one the highest altitude lake you will cross in your entire trip. Please know that the complete stretch from Chushul to Nyoma will require you to be traveling in a 4X4 SUV. The road is extremely bad and even with 4×4 engaged, your vehicle may still struggle to climb. After Mirpal Tso, you will drive further up to Kakasang La pass. The road will continue to get worse and about 35 kilometers later, you will reach the Hor La. This pass is at an altitude of 4,908 meters (or 5,017 meters) and right next to it is the beautiful Yaye Tso. Yaye Tso is a a volcanic lake and it’s actual elevation too is disputed as well. It is either at a height of 4,988 meters or 4,908 meters. Whichever one is correct, this is among the highest altitude lakes of Ladakh that are accessible by road. After you cross this lake, it is a downhill drive on the Nyoma – Mahe road. If you were climbing up from Nyoma side then you will first reach Yaye Tso, then Hor La pass, then Kakasang la, and then finally Chushul after crossing Mirpal Tso on the way. All that I mentioned about Mirpal Tso in terms of bad road will apply for Yaye Tso as well since both these lakes are located on the same road. There are two more lakes located on the Chushul – Nyoma stretch that almost no one knows about. Both of these lakes are located in Changthang Wildlife Sanctuary. The first one is called Ordong Tso or Yusup Tso. It runs for a total length of 6.59 kilometers which proves that it is actually quite a big one. Catch however is that getting to this lake is very difficult. From Leh, you will first have to drive all the way to Yaye Tso which also serves as the Base Camp for the 6,529 meters high Chakula Peak (also known as Chaluka or Chalunka peak). You will leave your vehicle parked at Yaye Tso and then will have to trek all the way towards the Chakula peak and see Ordong Tso on the way. It also means that you will have to bring your own camping gear and stay here for the night because walking to the lake will definitely take a few hours. This is the second lake located near Chaluka Peak. Ideally both Ordong Tso and Yashu Tso are covered while climbing up the Chaluka Kangri. A common belief is that Pangong Tso is the only lake that is shared by India and China. What if I told you there was another one that crosses over the border of the two countries and is equally stunning? This lake is called Spanggur Tso or Maindung Co or Mandong Cuo. It is at an elevation of 4,305 meters and has an area of 61.6 square kilometers. It was completely under Indian control before the war of 1962 when Chinese troops attacked and overcame four Indian posts in the area. Sadly enough, this lake is out of limits for tourists as of now. There is no motorable road to the lake and permits too do not get issued. This lake can be approached from Chushul through a gap in the mountains called the Spanggur Gap. Like Tso Moriri completely overshadows Kiagar Tso, there is another small lake that gets ignored because people are rushing to see its bigger sibling. This lake is called Chagar Tso (or Chaghar Tso) and is located about 20 kilometers before Pangong Tso. But since everyone is excited to see Pangong and rushing towards it, rarely anyone bothers to stop to see Chagar Lake which maybe tiny in size but stunningly beautiful nonetheless. This is the lake which is right there, but invisible. Nobody sees it. This little lake is a gem in its own right, yet even in peak season, you won’t find anybody here. Everyone is focused on Pangong Tso. You do not need to spare any additional time for this lake. It is right next to the road on Leh Pangong route, sitting silently, sparkling in the sunlight all day long and watching the tourists pass by. Just keep an eye out for this small wonder, stop for a while to take a break, click some photos and be on your way. Yarab Tso (also known as Yerep Tso or Ya Rab Tso) is a small lake located in Nubra Valley. This lake is considered to be holy and is situated near Sumur village, around 15 kilometers from Diskit. There is no motorable road to the lake and it can only be reached after a short walk. Not many people know about it hence not many have visited due to which, it is sometimes also referred to as “hidden” lake. The entire surrounding of the lake is very serene and peaceful. The trek is a short one of merely about 20 – 30 minutes uphill. Ask of the locals when you reach Nubra Valley and anyone will be happy to direct you towards the location of the lake. Because the lake is considered as sacred, camping on its banks or bathing in it is restricted. Please do not attempt to do so or you will get in trouble with the locals. These twin lakes are located at the top of Pensi La Pass in Zanskar Valley. These two are very small lakes situated right next to each other. Driving from Kargil towards Padum, you will first cross the small town of Rangdum and then climb up the Pensi La. At the top of the pass, you will leave your vehicle parked at the road and walk a little towards these lakes. These lakes are located about 150 kilometers from Kargil and 78 kilometers from Padum. Standing on the banks of these lakes will truly give you one of a kind of an experience. You will be standing at the top of a high altitude pass with magnificent Drang Drung Glacier on one side and the twin lakes of Stat Tso & Lang Tso on the other. The sight you will witness here will remain etched in your memories for a very long time. This is another lake which is practically invisible to tourists because everyone is rushing towards Pangong Tso. This is a small lake located right at the foot of Chang La Pass as you drive down towards Pangong. There is a lot of greenery around this lake and you will also find ducks swimming in it. It is definitely worth stopping and taking a small break while clicking a few pictures of the lake. If this was your first trip to Ladakh; then I would recommend that you keep your itinerary limited to just Pangong, Tso Moriri and Tso Kar. If you were visiting Zanskar then you can include Stat Tso & Lang Tso as well. If you were traveling by road, then Deepak Tal and Suraj Tal will too get included. A few others that are on the way to Pangong, Tso Moriri and Tso Kar will get added to the list automatically. Pangong is definitely the most famous lake in Ladakh. This will really be an unfair comparison because in my opinion, all of these lakes are equally beautiful. With that being said, Pangong Tso and Tso Moriri are widely considered to be the most beautiful lakes in Ladakh. That concludes our list of lakes in Ladakh. These are just a few to name because there are numerous other lakes in the hills still to be explored, documented and named. Even near Pangong, there are several other water bodies big enough to be called a lake but not yet named. I hope the information above was of help. If you have any questions; or need any other details; please feel free to ask in the comments section below; or at our Community Forum; and I will be glad to answer.